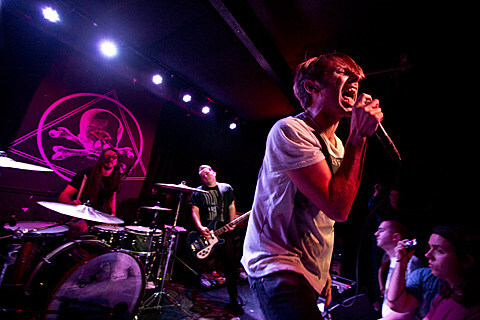 Geoff Rickly’s career has arguably been more busy since the breakup of Thursday. He’s running his record label again, and is currently involved in at least three musical projects, one of which is the high-concept screamo band United Nations who headline tonight’s show. Opening is post-rockers Black Clouds (on Geoff’s label) and punks Loud Boyz. It only took Harlem rap duo Cannibal Ox 14 years to release a followup to their now-classic debut, The Cold Vein, and it’s finally out this week. El-P didn’t produce this time, but the duo still deliver plenty of their hard-hitting rhymes. The rest of the lineup is pretty amazing too, with The Genius himself, GZA, and Roc-A-Fella vet Freeway. Dave Lombardo is sorely missed in the current lineup of Slayer, but fortunately he still gives us a chance to see him in his newer band Philm. Tonight’s their second of two NYC shows on this tour. Los Angeles band Corners make gothy post-punk, as can be heard on last year’s Maxed Out on Distractions which you can stream below. Hop aboard Wyatt Cenac’s weekly Night Train comedy show with guests Myq Kaplan, Zach Sherwin, Nore Davis, Tanael Joachim, and Scott Dooley.